As trading updates from the key end-of-year period for UK retailers continue to come through, investors are watching closely. Initial evidence is worrying. The British Retail Consortium said 2018 was the worst Christmas for a decade, with zero growth in sales overall. The death of the high street is routinely speculated upon as online competition ramps up, but the argument seems more nuanced rather than a binary choice between online or bricks and mortar. Retailers are certainly a prime target for short-selling hedge fund managers. Both Marks & Spencer (MKS) and Debenhams (DEB) amongst the UK stocks most bet against. Pets at Home (PETS) and Morrisons (MRW) aren’t far behind, while others have already gone out of business. But at the end of 2018, investors began to wonder whether something similar would start to happen to the online players. A profit warning last month from ASOS (ASC), which prompted a near-50% share price fall, surprised many. The AIM-quoted firm said it had seen a deterioration in sales during November, a key month, meaning it had to cut its annual outlook for sales and profits. Rivals across the board were hit, too. However, Boohoo (BOO), which reports on Tuesday, swiftly reassured investors it was trading “comfortably”. As a result, many commentators decided it was more than likely an ASOS-specific issue. Indeed, investment bank Morgan Stanley had sent a note to clients the week before cautioning that the company was burning through cash at an alarming rate. Alasdair McKinnon, manager of the Scottish Investment Trust (SCIN), notes that online retail is “grossly unprofitable”. “It’s just a market share grab that burns cash,” he adds. But fund managers do see bright spots amidst the doom and gloom. Indeed, some of those retailers who have managed to combine a store estate with a good online offering are tipped to thrive. ASOS and Boohoo are seen as two of the biggest successes to come from the UK’s Alternative Investment Market and still reside on the junior market. But, as a result, valuations are lofty. There are, though, select opportunities for investors amongst small-cap apparel and footwear retailers. We profile some below. One problem the struggling retailers have in common is their store estate. They tend to be locked in to long leases and, as a consequence, rising rents. Shoe Zone manages its estate well. It chooses stores that are situated just off prime high-streets, where shop quality is lower and rents are cheaper, notes Laura Foll, co-manager of the Morningstar Silver Rated Lowland Investment Company (LWI). Leases are shorter, at around two years on average, meaning it can regularly review the rent it's paying. Rents on renewal in the year to September 29 2018 were down over 20%, the firm said last week in its preliminary results. Shoe Zone is also helped by their positioning as a ‘value’ retailer with a focus on non-discretionary products. Their average cost for a pair of shoes is £10 and they focus on school shoes, works shoes and slippers, amongst other things, which consumers need, rather than aspire to own. This should insulate it from risks of a Brexit-related downturn, too. Thus far, since IPO, it’s very much been an income story for Shoe Zone. The balance sheet is strong, meaning they can pay good dividends, and supplement that with regular specials. Last year’s yield, including the special, was around 10%. Until prelims, shares had moved little in almost five years since flotation. That’s largely because sales have been stagnant. But its profitable online offering and move into ‘big box’ stores provides potential for future capital growth. Shares are up 20% on the week to a 45-month high, but the forward price/earnings multiple on broker finnCap’s 2020 estimates is still just 12 times. Finncap, which rates Shoe Zone as a ‘buy’, agrees. It told clients the step-change in confidence around its strategic growth ambition “is a significant moment”. “Shoe Zone is entering into a distinctive new phase of growth which, in turn, should have important long-term implications for sentiment, forecasts and valuation,” explains director of research Peter Smedley. Alongside a sensible store footprint and efficient online business, a third pillar to success in the current retail environment, says Abby Glennie, investment director for UK equities at Aberdeen Standard Investments, is having a strong brand with a unique product offering. Joules, held in Glennie’s SLI UK Opportunities fund, has all three of these qualities. In addition, it is pursuing a number of potential growth areas, both in the UK and abroad, where it is expanding. The US and Germany are its key international markets. “The strength of their British brand has a strong attraction to those consumers,” says Glennie. 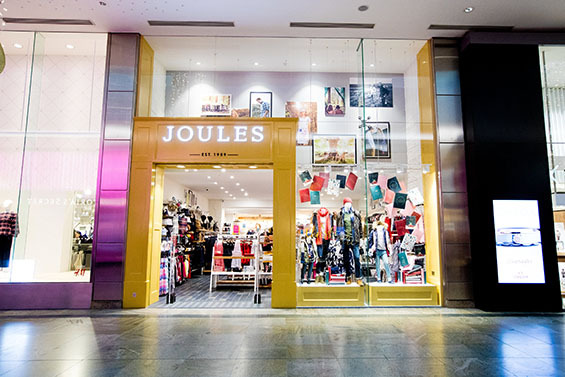 Joules has mainly been a womenswear brand, but has also begun branching out into menswear, homeware and children’s clothing – providing more scope for growth. The online business is well-invested, with strong infrastructure capable of managing a much larger business and the ability to effectively manage inventory across channels. An “impressive management team” is also in place, with founder Tom Joule still heavily involved and acting as chief branding officer. Their breadth of product means they are not overly seasonal, like many – Next included. Elsewhere, moving into furniture, eyewear and other areas will help expand operating margins, as does their disciplined attitude to promotions and discounting. Despite these points, and a strong December trading update, the share price is down over a third since peaking in mid-June as sentiment towards the sector weighs. “We believe Joules has an attractive investment case given the growth potential… and an attractive valuation,” says Glennie.